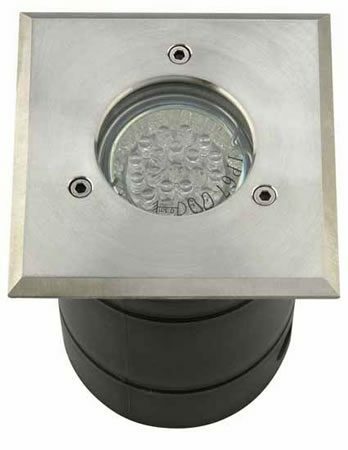 Marine grade stainless steel square GU10 ground light. IP67 rated, suitable for outdoor use, with a separate ground sleeve for easy maintenance. Can be installed in any ground including concrete, tarmac etc. 2 cable glands for easy fitting. This fitting can only be used with energy saving GU10 LED lamps. This gives a huge range of colours and styles for you to choose from. A blue LED cluster lamp looks particularly attractive in ground light. A 3w LED spotlight lamp can illuminate overhanging trees or shrubs to give a wonderful shadow contrast. Hello Joe and thank you for the question. The sleeve is 90mm diameter x 130mm deep. I have added this information to the product description.